One of my personal projects this summer is to complete a children’s story book involving an adventure with ground squirrels. Last week I finished the final draft of the text. I am planning to put together as many of the illustrations as I can by the end of summer. My problem is that the fantasy of the story may not fit with the reality of the situation. PskKeep is plagued with ground squirrels. They have tunneled everywhere into the side of the hill above the main house. By mid day they can be seen running around stuffing their cheeks with stolen chicken food and greens from the vegetable garden. They have access to plenty of water. The ravens have driven off the hawks and the chickens and goats have discouraged the rattlesnakes so there is no one to prey on them. They have found paradise, and in paradise they have multiplied. I am going to have to bring myself to start trapping these guys to thin down their population. I have been avoiding it for weeks, I have used every excuse I can to avoid setting up the trap. But soon some of them will have to become food for the ravens and the dwindling population of vultures that roost in the blue pines. That unfortunate fact haunts this story. It was the 7th of June. I had just cleaned the house. It had taken me all day to vacuum and wash the floors, and the bedding. 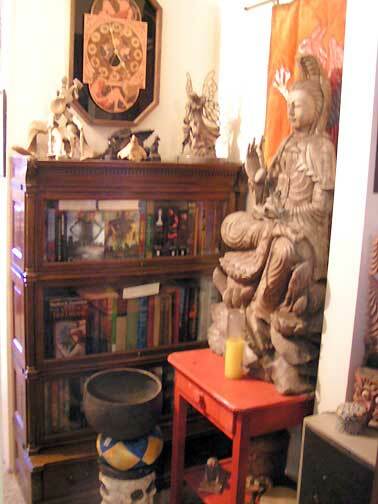 I had whisked out the last of the winter spiders and dusted off the many avatars of the goddess. 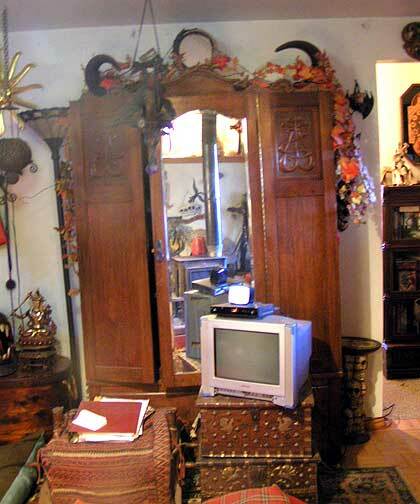 Hallway to the back rooms of the house. I sat back with a cold beer as the sun went down beneath the high dome of pressure building like a bell jar over the land. A scorcher was destined for tomorrow and my plan was to tough it out with two small fans in a clean house. I was listening to the NPR news report about the tragic shooting at the Santa Monica College library where I had been a student many years ago and worked for a number of years as a part time instructor. I was distracted by a high-pitched sound very much like the electronic device for unlocking a car door. At first I though a bird had flown into the living room. But there was no bird flying around. I tried to dismiss the chirping sound but it continued intermittently until I tracked it down. 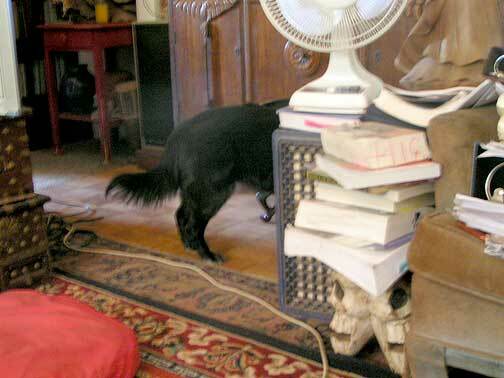 It was coming from under the armoire that holds the antiquated sound equipment and racks of CD files. I knelt down with a fizzling flashlight and confronted a young ground squirrel. Confronting the ground squirrel under the armoire. Great! I just cleaned my place and now I would have to tear it apart to get this little guy out. Otherwise it would eventually die while wandering though the maze of my universe. I though maybe the dog and the two ranch cats would do their thing and drive the squirrel outside or worse. All three of them, their differences forgotten, were focused on the hunt. This seemed a little one-sided so I went and got a welding glove and tried reaching under the cabinet to rescue the squirrel. But the thickness of the glove and the tight space made me a poor player in the game of hunt and prey. The squirrel crouching behind the wiring easily evaded me. Night settled in. The ground squirrel quieted down. I placed a piece of plywood across the doorway to the back rooms of the house so that the squirrel would not wander hopelessly into a more increasing complex maze. The cats lost interest once the squirrel was quiet and the dog found something outside to worry throughout the night. The next morning it was time to dig out that squirrel. I was planning my strategy over a cup of coffee when I heard the chirping under the altar. And, yes, it was closer to the outside door. The squirrel was on the move. I keep some piece of plywood in the house for doing artwork in the living room. My plan was to use the plywood to cordon off the options for the squirrel so that it would eventually find the door to the outside. But as I sat there I saw movement at the base of the sliding glass door. It was the squirrel looking for freedom. 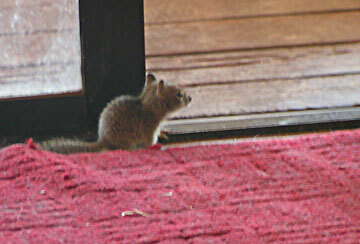 Young ground squirrel poised at the open door. I watched the squirrel, its nose quivering as it checked in all directions for danger. It meandered inquisitively toward the open door. Suddenly one of the cats appeared. The squirrel dashed back under the cedar chest. I chased the cat off and using a broom handle, I tapped on the floor at the other end of chest to drive the squirrel back toward the open door. Again the cats were there and the dog seeing the squirrel rushed in. The dog rushing in to catch the squirrel. 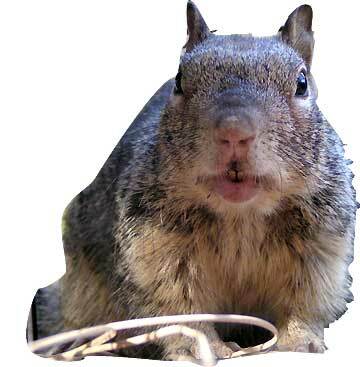 The squirrel streaked back under the chest and ran back behind the altar. 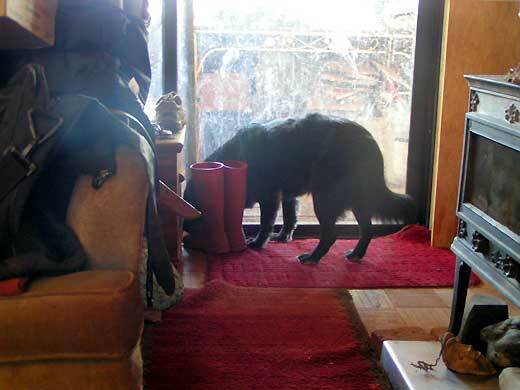 With some discussion I sent the cats off the porch, told the dog to be still and sat down to wait it out. It did not take long for the squirrel to peek out again from under the chest. 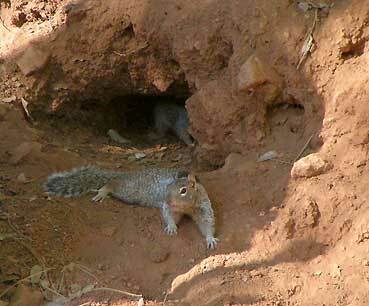 It was a young squirrel born in the burrows this spring. It was about a third the size of the adults. How did it even get inside? It must have been coming for the cat chow. I got into the habit of placing a small bowl of cat food on the back porch on days when I had to be gone for long periods of time. Lately I noticed that the bowl of cat chow was completely empty when I came home at night. The cats will nibble but never completely clean out the bowl. Something else was working that food. I sat still and watched the squirrel making its way toward the door. It would peer out then rush back under the cedar chest. It chisrped plaintively to the family of squirrels outside. I could see that it wanted to try to run the gauntlet but instinct made it cautious, preferring the safety of the maze to the single chance of freedom. I tried tossing a slipper between the chest and the squirrel to flush it out the door, but like greased lightening, it streaked back under the cedar chest. Another wait. 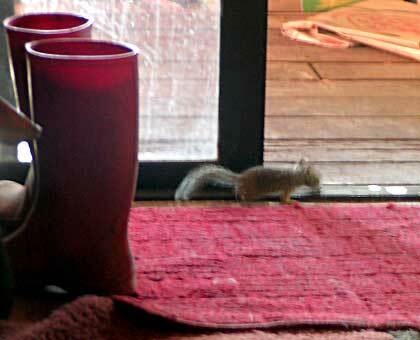 But this time the squirrel was on to the freedom of the open doorway. It did not take long for it to work its way back across the threshold. I rushed forward and slid the door shut. Ah end of story! I could get moving now with the things I had to do before the heat settled in. Except! Looking down I saw the squirrel peeking around the corner of my rain boots. It had moved so fast that I did not even see it run back into the house. I thought about stepping aside and letting things work out as they will and just going on with my chores of preparing the livestock for the heat of the day. But I wanted to close up the house as soon as possible. The heat was building hard and fast. Already the ravens were panting in the trees. The squirrel must have recognized where it was in its hope for freedom. A few minutes later it was again poised on the threshold of the door. This time it bolted across the porch putting all it had into the gauntlet run for the burrow against the hillside. I do not know if it made it. The cats were out of sight and the dog was interested in a breakfast snack. The ground squirrel still had to navigate the porch and the corner of the house. It still had to dash down the steps, cross the drive and make it up the hill, but I had a feeling that it was very familiar with that portion of the journey. Posted on June 9, 2013, in Psi Keep Center for the Arts, Uncategorized, Unforeseen Events, Wildlife and tagged forest maintenance, ground squirrel, psiKeep center for the arts, squirrels, wildlife, wildlife maintenance. Bookmark the permalink. 1 Comment. Great story and well-told:) This is your writing niche!